The great thing about summer in Boston, besides the glorious weather (note: compared to Texas, this is amazing! ), is all the delicious seafood. Lobster rolls are absolutely one of my new favorite foods – and something I didn’t experience until I moved. Despite my love of seafood, there is one item that I don’t take advantage of very often: oysters. In my experience, many of my friends who are New England natives don’t like seafood quite like outsiders do. There are plenty of people in New England that love the seafood, don’t get me wrong, but for the people I usually go to restaurants with, seafood is a no no. So, when my out-of-town friends visit, the first item on the agenda is visiting a seafood establishment. 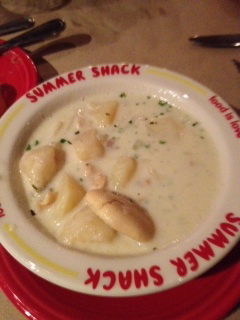 Recently, I had the opportunity to eat at Summer Shack, a restaurant from Chef Jasper White. It’s a frequent mention on the local restaurant review show Phantom Gourmet, which is one of my favorites for discovering new restaurants (both in events and on the show). I definitely need to go back to Summer Shack to try the lobster/clam bake, what I like to call the more traditional route when testing out seafood establishments. However, a night full of oysters is a good jumping off point. I had an opportunity to try each of the Oysters offered from the raw bar – which change based on the season. 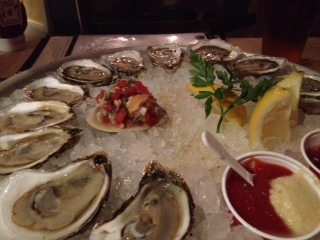 My absolute favorite was the Cotuit oyster – a very smooth with a lot of flavor but not a fishy aftertaste. Honestly, like wine, I’m not good at describing the “flavor profiles” you experience with Oysters. Though, I will say, over the course of the night, my table split around 40 oysters and a majority of them were Cotuit. I also really enjoyed the ceviche (also a part of the raw bar) and the spicy bermuda fish & crab chowder. This entry was posted on Tuesday, August 7th, 2012 at 11:24 am	and tagged with Boston, clam chowder, eats, oysters, seafood and posted in Food. You can follow any responses to this entry through the RSS 2.0 feed.